Digital transformation is happening across all industries and sectors in nearly every type of organization around the world. It is a way to rethink how value is delivered and how technical systems and capabilities are blended with human and organization systems and capabilities. People are starting to expect the convenience of digital solutions, and virtually every business has already transformed digitally to a certain extent. However, the implications of digital transformation extend much farther than many imagine. Digitization, when undertaken strategically, has the potential to transform an organization—and its potential for growth—in previously undreamed of ways. Going digital in a way that will result in lasting success for your organization requires a strategic approach. 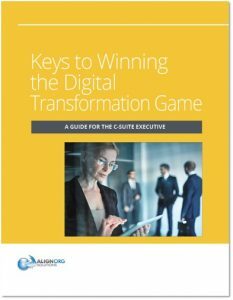 This complimentary guide, Keys to Winning the Digital Transformation Game, introduces the steps and practices essential for successful digital transformation. Download our free guide today to learn the essential principles and strategies your organization needs to win the digital transformation game.